Vented dryers have many advantages over ventless. In some condominiums or older buildings, ventless may be your only option, however, if you have a choice, a vented dryer is always the better choice. Ventless dryers are notorious for taking a very long time to dry. This is because the technology used is not efficient. A vented dryer may take around 45-50 minutes to dry the average load of laundry, whereas a ventless could run for an hour and a half. If you attempt to dry a bulky comforter or blanket, it may end up taking 3 hours or more! One of the complaints about ventless is also the added time ends up making the clothes more wrinkled. This would then add to your ironing time. One of the reasons for choosing a vented dryer is to actually remove the moisture from not only your laundry, but also your home. When using ventless, you are retaining at lease some of the humidity in the air, and some ventless dryers have tanks that hold the condensed evaporation and you have to continually empty it. When using a vented dryer, you basically clean your filter and then have a duct cleaner come once or twice a year to make sure your ducts are not clogged up. With ventless, not only must you be acutely aware of the lint filter, you have to dump a water tank, clean the condenser at least once a month among other maintenance tasks. Because ventless dryers have added technology, you are more prone to having parts that fail. Ventless dryers are usually smaller in size, so you can't fit as much laundry in it. This means more loads being dried for longer times. The average vented dryer can hold more than 7 cubic feet of laundry, while compact condenser dryers usually hold half as much. Vented gas-heated dryers not only release the evaporated water and lint, but also removes dangerous fumes. Chemical-soaked rags or towels that were used in cleaning, for example, may release toxic fumes when placed in a dryer. 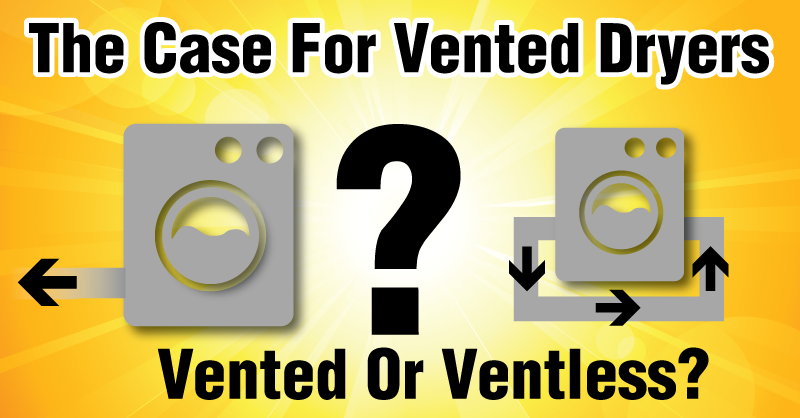 Ventless dryers are usually more expensive to purchase than their vented counterparts. Ventless also increases drying time, which may increase your electric bill. Vented dryers remain the choice for Americans who want size, speed, and savings. Couple this with The Dryerbox and DryerFlex, and you also get assistance with fire prevention.